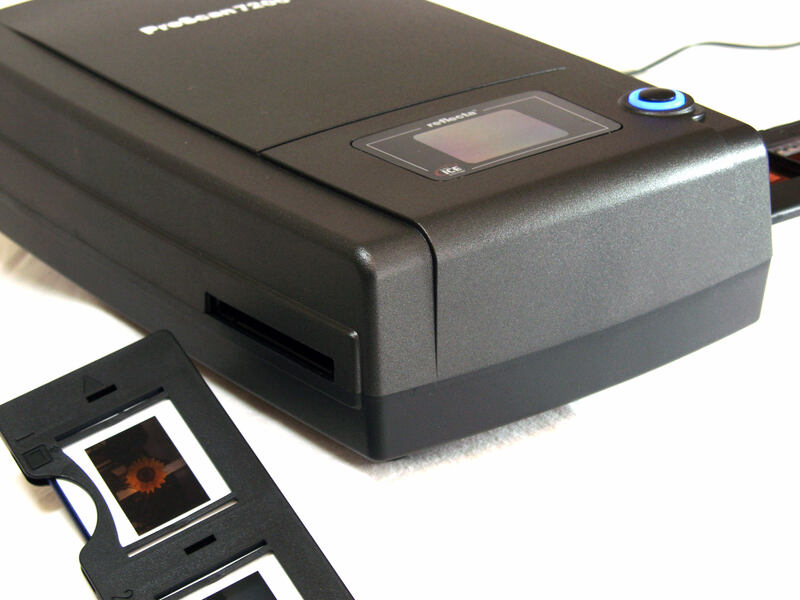 Stephen Waller reviews the Reflecta ProScan 7200, a 3600dpi scanner with built in ICE, ROC and GEM. The ProScan 7200 was recently introduced to the UK priced at a little over £450. It is about half the size of a classic domestic A4 flatbed scanner and is of a similar weight. It has a relatively high Dmax of 3.8 (dynamic range), is a true scanner incorporating infra-red dust detection and has a maximum scan resolution of 3600 dpi. This can give a scan of 16Mb at 24 bit and up to 47Mb at 48 bit in Tiff format. It is now available for a little above £300, but does the 3600 dpi, ICE, ROC, and GEM justify the outlay? The standard film and slide holders are robust and relatively easy to use. The slide holder is particularly easy to load, as the slides go into a slot from below. 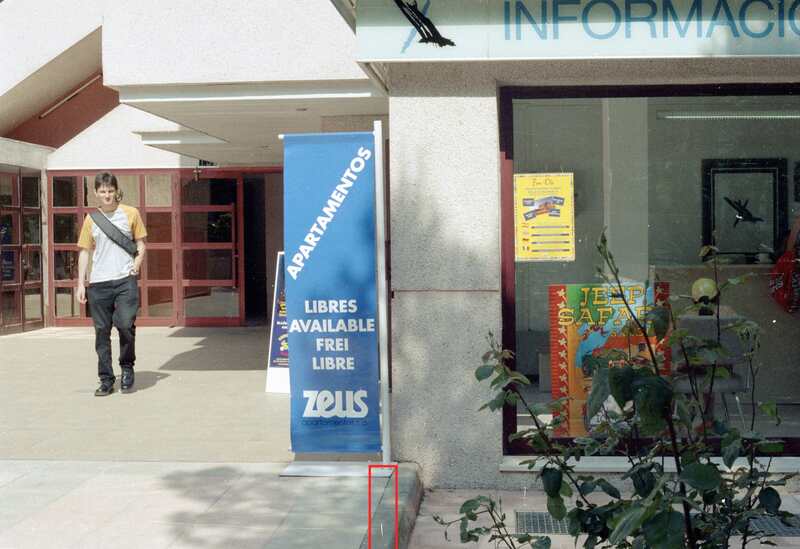 There is a back-lit viewing window to check the material to be scanned is aligned correctly. It uses hardware-based dust and scratch correcting ICE³-technology, ROC colour restoration and GEM film grain equalization. Scans would be suitable for printing at over A3 size with a little touching up. As with many USB devices, the software should be installed from the CD before connecting the scanner, and is fairly straight-forward. The standard bundled software is Cyberview, but Silverfast is also available as an extra enabling superior colour control. Cyberview is a capable piece of software, but you would probably prefer using your personal favourite. 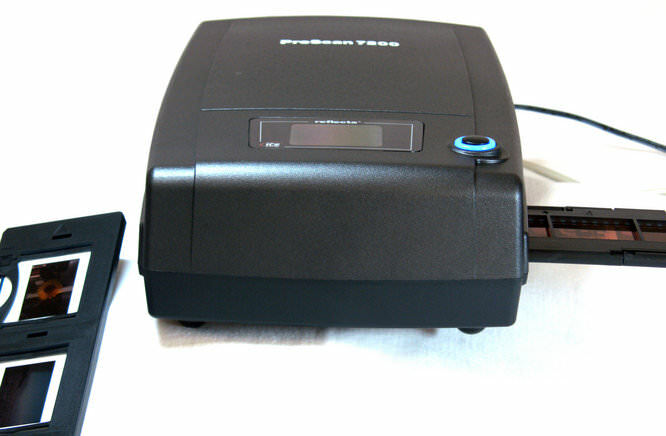 It is also compatible with Hamricks VueScan, however the scanner itself does not support multi-pass scanning. A generic positive film filter is used for slide scanning and negative scans require you to select from a list of popular film types. The large button on top allegedly sets the device scanning, however this may require a software setup, as it did nothing for me. Scanning times are slow, and batch scans are not an option. It is however ideal for getting the best out of the cream of your collection ready for printing at a large size. The dust removal is very effective and impressive, though it seemed to have issues with removing minor scratches. 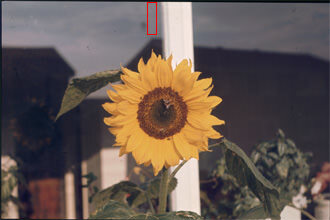 Sunflower, showing cropped area. Salou negative, showing cropped area. Full size crops are shown below, to show the original scan, as well as the scan with ICE on. It does show how effective the ICE can be, but not right up to the edges. 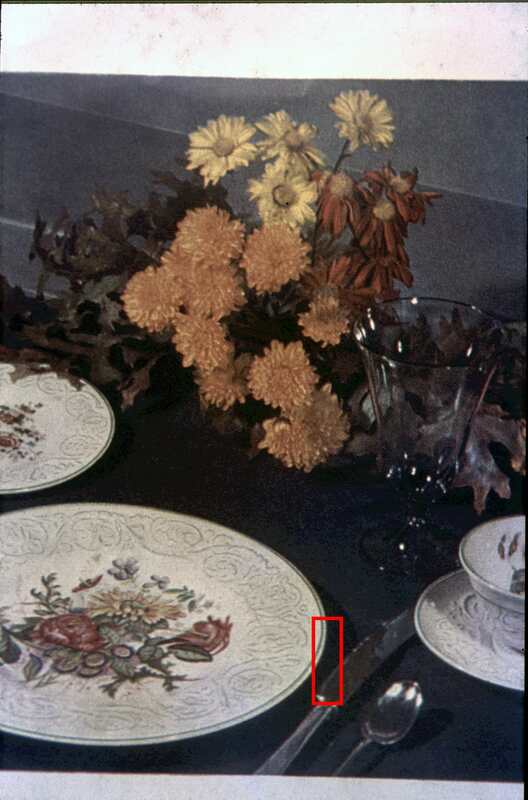 The resolution achieved can be disconcerting, as defects such as scratches and corner focus fall off were evident that other scanners with similar dpi did not reveal. 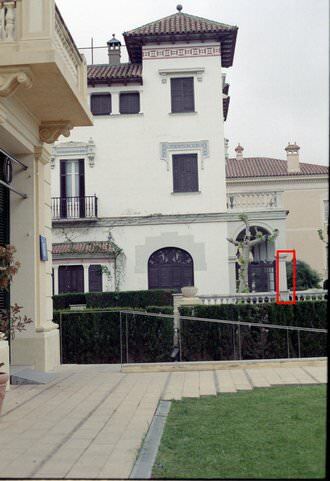 This was confirmed by re-scanning the trial film. 3600 dpi certainly got to the grain in the negatives I scanned, and the GEM smoothed most of it away again. 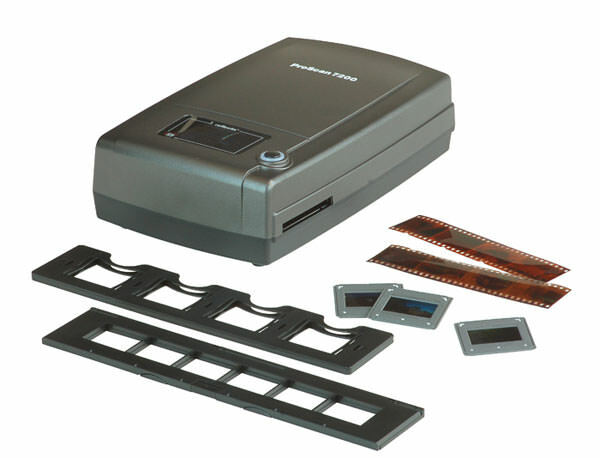 For capturing the maximum information from your more treasured film and bringing it into the digital age, it is hard to beat. 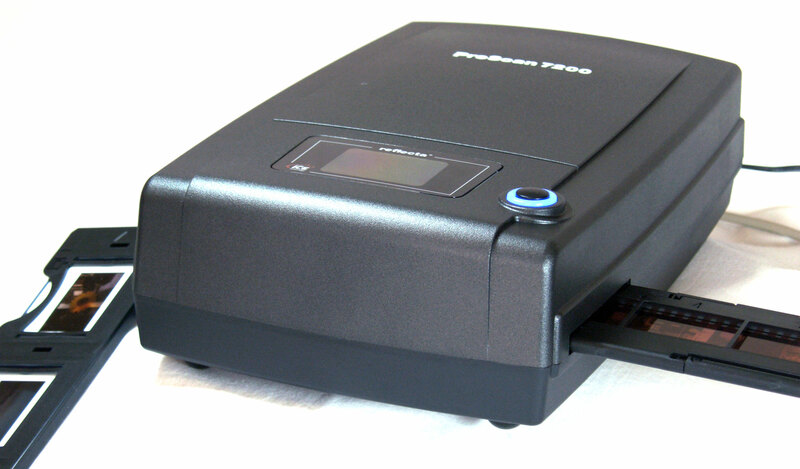 It is a high definition scanner capable of getting more from your films than you were expecting. I could not recommend it if you are just starting to catalogue your collection of negatives and slides, due to the labour intensive requirement of dealing with images individually.